Why Chiang Dao Cave is special ? 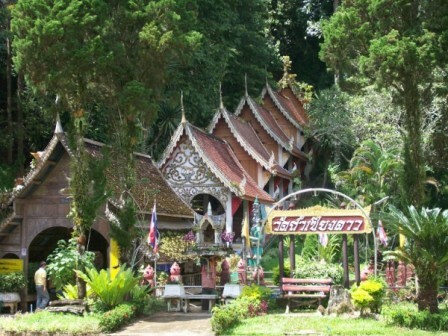 The cave of Chiang Dao is located 70 kilometres north of Chiang Mai on the road to Fang. The Chiang Dao Caves penetrate in to the Doi Chiang Dao which is a massive outcrop of rock rising to a height of 2,175 metres to be the third highest in Thailand. The mountain is usually shrouded in cloud and the area is home to Lisu, Lahu and Karen villages. The caves penetrate up to 14 kilometres into the mountain but access for the tourist is limited to 1 kilometre due to the location of illuminated lighting and how far the local guides will take visitors. Local guides [ with electric lanterns ] are recommended due to the the fact there are different levels one can wonder into and soon become lost in the dark [ it is very dark ]. The Caves have had a significant presence for the locals for over 1,000 years as is evident by the ancient Shan Chedi near the entrance and the folklore surrounding the Caves. The caves are venerated by the Thai and Shan people as is evidenced by the offerings, statues and decorations present at the entrance and inside. At various locations within the Caves are small temples and statues of the Buddha. The Caves are interesting for the experience of being in such a location, the dripping stalactites, and other stalagmite rock formations. What to explore at Chiang Dao Cave? In the heat of the day, the coolest place in town is the Chiang Dao Cave, a complex said to extend some 10km to 14km into Doi Chiang Dao. There are four interconnected caverns that are open to the public. Tham Phra Non (360m) is the initial segment and is electrically illuminated and can be explored on your own. It contains several religious shrines, a common feature of Thailand's caves, which are regarded as holy meditation sites. There are also some surreal-looking stalactites reminiscent of a Salvador Dali painting. To explore the other caves – Tham Mah (735m), Tham Kaew (474m) and Tham Nam (660m) – we recommend that you hire a guide with a pressurised gas lantern (100B for up to five people), not because you aren't intrepid enough to go solo but because the guide service provides income for the local villagers. The guides point out the interior cave formations that have been named, yet another Thai cave tradition. Local legend says this cave complex was the home of a reu·sĕe (hermit) for a thousand years, and that the sage was on such intimate terms with the deities that he convinced some tair·wá·dah (the Buddhist equivalent of angels) to create several magic wonders inside the caverns: a stream flowing from the pedestal of a solid-gold Buddha; a storehouse of divine textiles; a mystical lake; a city of naga (mythical serpents); a sacred immortal elephant; and the hermit's tomb. Such fantastical wonders are said to be much deeper inside the mountain, beyond the last of the illuminated caverns. There is a temple complex outside the cavern, and a stream with huge carp and catfish you can feed (which handily counts as making merit via a donation). Vendors by the parking lot sell medicinal roots and herbs harvested in the nearby forests. How to get to Chiang Dao Cave? Chiang Dao Caves are situated approx 70 klms north of Chiang Mai on a good highway through rolling hillsides. 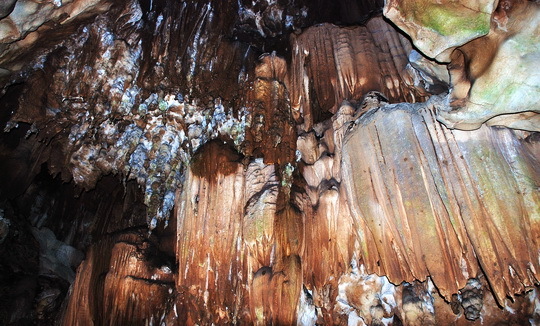 The Caves are one of the main attractions in the Chiang Dao National Park. From Chiang Mai the trip takes about one and a quarter hours by car and as you approach closer you will see the scenic Doi Chiang Dao mountain range. You must hire the guide and rent the lantern to see the biggest and best parts of the cave. You really do need the lamp guide or you will get lost. It's hot in there so dress accordingly. I really enjoyed our trip to Chaing Dao cave, even though it was certainly geared towards the tourists it was still incredibly interesting.The whole temple complex was nice, apart from the Spanish flamenco music being blasted out of the speakers...The cave itself was great though, you have to pay 40THB to get in to walk the electrically lit part of the cave, which provided you are reasonably fit to climb 50 steps you will manage perfectly fine and you get to explore the caves reasonably well without having to venture deeper. For those more adventurous there is the option of having a paraffin gas lamp tour by one of the local villagers, which has you crawling through gaps 2 - 3 feet wide, this cost 100THB and there is a sign when you pay your money asking for a 100THB tip (according to the sign that is the norm) So, just call it 200 THB. We did enjoy our tour though and the benefit is that the guide explains the name of the different rock formations, she knows the way around so you don't get lost and she's holding a lamp!! believe me where you go there isn't any electric at all, it is absolutely pitch black, which brings me to the other piece of advice head the signs advice do not!! go walking around on your own!! it is a maze of tunnels if you get lost that's it.We did walk down to the reclined buddha statue, which is electrically lit however, once we had done the lamp tour, there wasn't anything particularly special about the walk down. So, that isn't necessary if your not too fussed walking a further 500m down. We went into the caves, and were immediately stopped by a lady telling us we couldn't go any further unless we paid for a guide. It is very well lit down the one passage, and everyone else was just walking past. We ended up saying no thanks, and walked down the lit tunnel. It was our understanding that you only needed a guide if you wanted to go down the side that was not lit. The part of the caves that are lit are very interesting, and there are many different formations to see. We chose not to go down the unlit side as neither of us like spiders, and we felt we had seen enough already. It is worth the 40 baht, but we felt there was much more to Chiang Dao. These caves are often presented as the main attraction, but the views and country side are much more impressive.